We embarked on a journey to Paris to capture the essence of romance in this Paris wedding styled shoot. The second part of our adventure happened at Montmartre, where we captured the spirit of the night in Paris. Our model loved the dress From Kobus Dippenaar’s Anna Georgina collection! The feminine bodice embroiled with pearls and countless layers of tulle were so much to work with! Our Paris wedding styled shoot took us to all the famous spots, where artists used to gather for centuries. We have started at the famous Sacré-Cœur basilique, with it’s iconic white walls and countless towers. 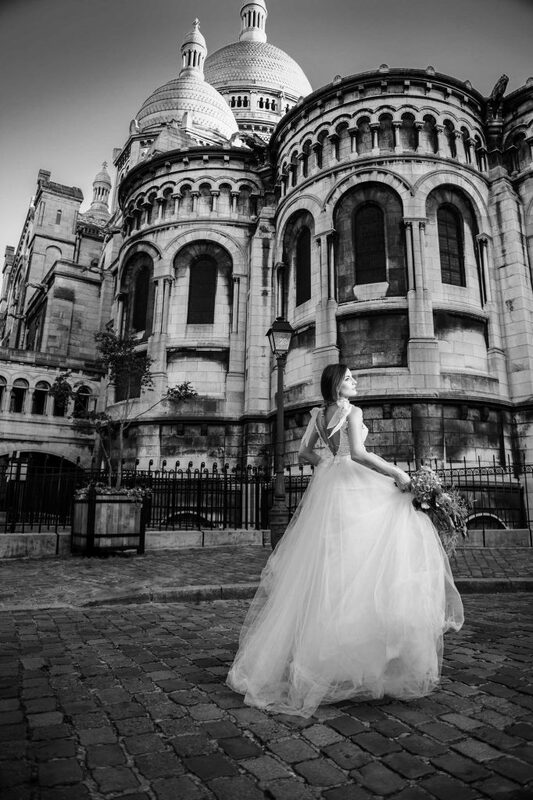 The wedding dress looks so pure against the monumental basilique! We loved shooting on pebbled road, that remember the carriages and the crowds visiting the church for centuries! 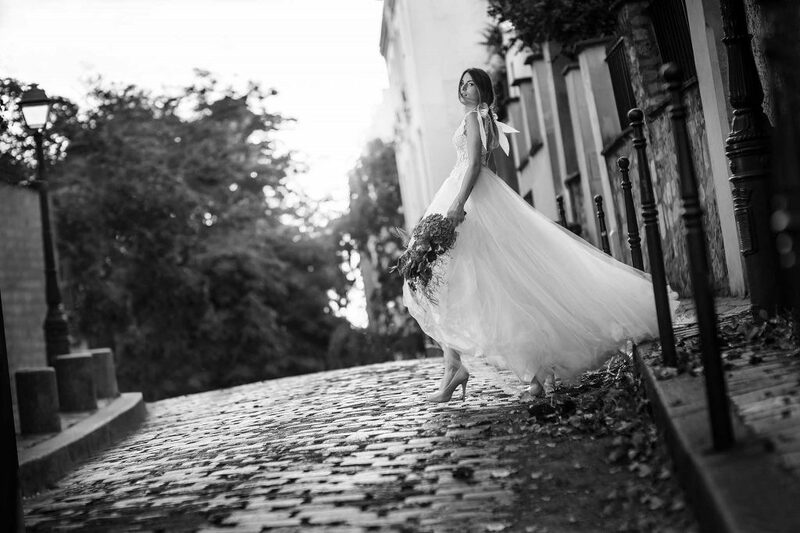 Montmartre holds countless secrets to be captured in a Paris wedding night shoot. Once the lanterns start lighting up, the place transforms into a mysterious scene. Our “bride” got into the mood perfectly! Slowly strolling along the narrow streets, she played with the lush dress like the dancers once did at The Moulin Rouge! Even the tourists were intrigued by our Paris wedding night shoot. Our last stop was again at the Sacré-Cœur basilique. The night lights filled the streets, transforming the church into a dark, mysterious shape. The dress was glowing in the street lights, as the model turned around and played in the evening breeze. Those last shots, even though a bit misty and maybe not pin sharp, capture a unique atmosphere of the french romance. Being ablate play with Kobus’ feminine and delicate dress on the footsteps of the Sacré-Cœur was unforgettable! 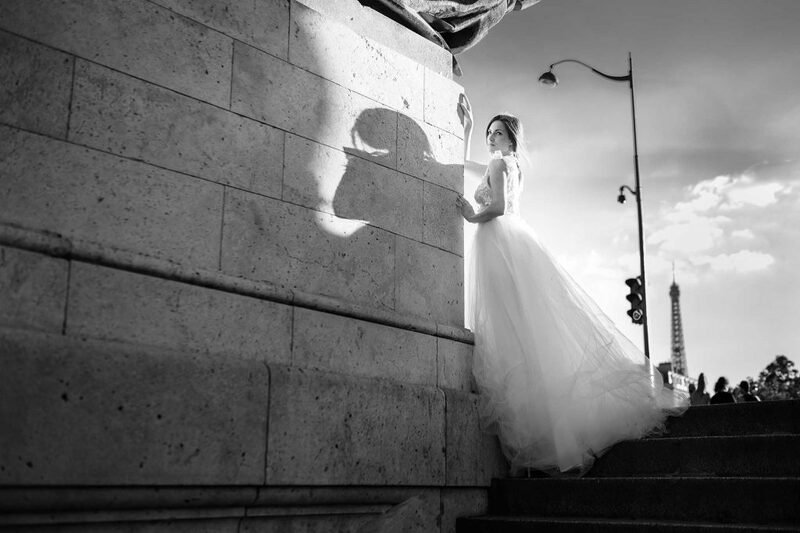 I hope that our Paris wedding night shoot captured the feel of what’s considered French. The delicate night light, the fine fabric of the dress and the beauty of our model, all in those few images. We are all hoping to go back to those magical places, next time with more exquisite gowns from Anna Georgina collection!